House and time at Malvern: No 4, 1914 - 1916. Regiment: Royal Naval Air Service Manston. Died: 06 April 1918 aged 19 in United Kingdom. Killed flying. Son of Raymond Gillett, 101 Broadhurst Gardens, Hampstead. b. 1899. Middle V - Lower VI. 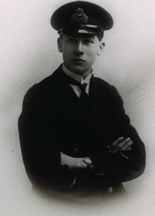 Great War, Flight Sub-Lieutenant R.N. 'He was a most attractive boy, who promised to become a leader in his House, had not an opening in business taken him early from school. Early in 1917 he offered himself for the R.N.A.S., and on his eighteenth birthday was accepted as a Cadet. He gained his Pilot's Certificate, and was under orders to go to France on April 8th. Two days earlier, while practising certain manoeuvres in a single-seater, he was killed in an accident for which he was in no way responsible. He was an exceptionally good pilot, courageous, and full of resource, while his happy and enthusiastic nature made him a general favourite. He was buried with full military honours in Hampstead Cemetery', on April 11th.' (Malvernian, Jun 1918). He was flying a Sopwith Camel B5688 at Manston War School when he was killed in an accident.